Council Speaker Corey Johnson. Making appointments is the Council’s third greatest power after voting on the budget and on land use. City Council leaders over the past year have talked a lot about race, justice and inclusion. But when it comes to whom the Council appoints to city boards and commissions, that talk translates mostly to Whites and people who live in Manhattan getting plum posts, according to a City Limits investigation. New York City’s population of 8.6 million residents is 32 percent white, 29 percent Latino, 24 percent African-American, and 14 percent Asian. 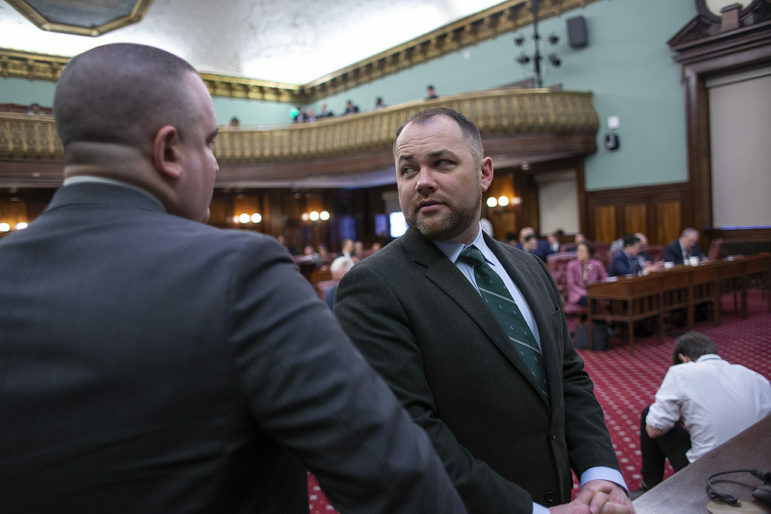 Yet, a review of City Council Speaker Corey Johnson’s appointments to boards, commissions, and councils during his first year in office found that 46 percent are white, 26 percent are Latino, 21 percent are black, and 8 percent are Asian. While the speaker only made 39 appointments in 2018—a fairly small sample size—the over-representation of Whites compared with other groups is striking, and a red flag for proponents of diversity in the legislative body. “That said, this was his first year as Speaker and he is determined to be better going forward so our cultural and civic institutions are representative of this great city,” she continued. Making appointments is the Council’s third greatest power after voting on the budget and on land use. The Council has the power to fill 241 appointments. The speaker has sole discretion over naming 70 percent of them. The terms for appointments are staggered. They are filled when the terms of previous appointees end. Appointees’ race was determined by reviewing news clips, social media, and business and governmental websites. Their residences were determined by reviewing voter registrations, social media, and property records. Under the City Charter and local, state, and federal laws, many of these boards, commissions, and councils provide critical governmental oversight functions on a broad range of issues, from local elections, to equal employment practices. By extension, some of the people named to these bodies have substantial power. Service on these boards also provides appointees with experience at the highest levels of their fields or in local government. Latinos—who first established a foothold here in 1928, when Puerto Ricans fled the island following a devastating hurricane, to today, when, with Dominicans and Mexicans, comprise nearly a third of the population—are somewhat under-represented among the speaker’s appointees. Blacks are more substantially under-represented, and Asians pretty dramatically so. In sharp contrast, Whites, who account for a third of the population, made up nearly half of the speaker’s first year of appointees. The early statistics on Johnson’s appointments mirror the record on the other side of City Hall, where de Blasio’s hiring practices indicate major racial disparities. Despite comprising nearly a third of the city’s population, Latinos account for less than 11 percent of the 4,700 people working in official/administrative level jobs in the de Blasio administration, according to 2017 report to federal regulators. While Latinos are the second largest racial/ethnic group in the city after Whites, they rank fourth in jobs in City Hall, after Asians—especially troubling when you consider that Latinos (mostly Puerto Ricans, Dominicans, and Mexicans) also are the poorest of the city’s racial and ethnic groups, and most in need of sound policy that reflects their community’s needs. In the City Council, the so-called outer boroughs did not win their fair share of appointments either. Nearly a third of the city’s population lives in Brooklyn, while nearly another third lives in Queens. A fifth lives in Manhattan, 17 percent lives in the Bronx, and six percent lives on Staten Island. But when it came to City Council appointments in 2018, Manhattan came out ahead, with 24 of the 39 appointments. There were four each from Brooklyn and Queens, two from the Bronx and one from Staten Island. One appointee hailed from outside the city, and residence could not be determined for three of them. From the day Johnson was elected to serve, he has been an advocate for open government, including expanding the participatory budget process. Johnson could do the same with the Council appointment process—by posting all 241 appointments on the Council website so that members of the public can apply online and publishing details of all appointments online for public scrutiny. The same could probably be written about the City Council’s hiring practices. I’m also trying to determine when it became mandatory to be bilingual in order to get a job with the City. Thanks for confirming what we already suspected! Racism rears it’s selective head. No one willing to ask about affectation preference, etc.? You’ve started going down a slippery path here. Let’s do civil service tests for these people. Two hundred forty-one is bigger than many city agencies now.